Air Circulation: Sufficient to provide even pulp temperatures throughout the ripening room. Ventilation: Use “flow through” ventilation or vent room 10-20 minutes every 12 hours (manually or by automatic fan). Our diagram of “Flow Through Ventilation,” designed to continuously vent Carbon Dioxide from the ripening room and introduce fresh air, resulting in more uniform ripening, can be seen at this link: “Suggested Flow-Through Diagram.” It also describes how to calculate the fan size for each room. Ethylene: Maintain 100-150 ppm until a “breaker” or Stage #2+ is reached, usually 24-36 hours (depending on temperature and maturity). Mature Tomatoes: Mature green tomatoes will ripen after harvesting in the same manner as they would on the plant, thanks to an external source of ethylene in the ripening room that triggers the fruit to release its own ethylene. However, immature tomatoes will erratically respond to external ethylene and possibly result in poor quality or delayed ripening. Harvest or receive only mature fruit. Whenever possible, avoid “holding” and delayed ripening. Tomatoes will respond their best and ripen evenly when external ethylene is applied soon after harvest. On average, fruit ripened at 18° to 21°C to a breaker stage can then be stored for more than two weeks at 12.8°C until a full red (stage #6) color is reached. Regularly take pulp temperature readings (at least twice per day) of each load of tomatoes and refer to these readings as you ripen. The greatest cause of tomatoes suffering a big loss in flavor and retail quality is cold. 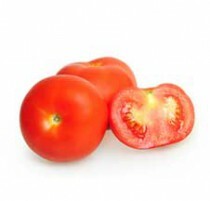 When tomato pulp temperatures are allowed to stray out of the proper temperature range, internal damage results in a mushy appearance of flavor decline. Therefore, it is crucial to ensure that pulp temperatures remain above 12.7°C at all times and at all stages of ripeness. When shipping tomatoes on mixed loads at air temperatures less than 12.7°C, use some form of protection such as insulated or plastic pallet covers to hold the fruit’s heat in. Check equipment often and smoke test rooms for air leaks at least once per year. A great resource for additional postharvest information on tomatoes is The University of California at Davis or The University of Florida.